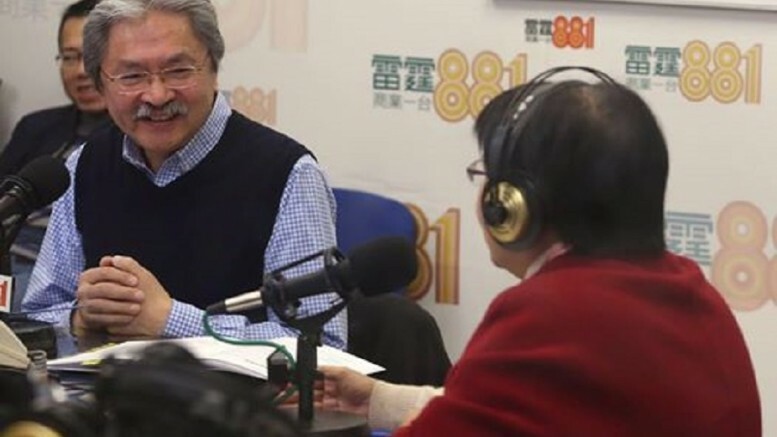 Financial Secretary John Tsang Chun-wah attends a Commercial Radio programme on his just-announced Budget. Financial Secretary John Tsang Chun-wah delivered the 2016/17 Budget on Wednesday, his ninth since he took office and last “full” financial blueprint before he stands down. This is because it will be election time when he is scheduled to deliver his next Budget by February next year. As it will be close to the transition of government it will not be appropriate for the incumbent to take drastic initiatives. Stability is the key word for a change of administration. He may not even still stay on the job if, as rumoured, he runs for the top post of chief executive. He will have to resign for that purpose this time next year. The key point of this year’s Budget is the lack of mega-sized plans. Prior to the Budget Day, media reports were focused on what the sweeteners will be and whether they represent a cut-back or an increase compared with previous rounds of hand-outs. And afteit was announced, the focus of media has shifted to the profound messages about his chief executive election plan embedded in his speech. Before the handover, the government gave a full analysis on the economic and financial trends of the city and elaborated their development strategies in their annual Budget. Those substantive contents have gradually disappeared from the Budget after 1997, which has become an annual balance sheet of the government. Before the handover, Financial Secretaries had enjoyed a “high degree of autonomy” in the formulation of Budget. Their philosophy of financial management and public finance strategy had made big impact on the city’s economic development. The Chief Executive has become the nucleus of power in the government after the handover. Under the principle of “executive-led”, major development plans of the city are originated from the policy manifesto of the Chief Executive. The Financial Secretary only plays the role of coordinating and implementing the Chief Executive’s policies. Following the introduction of the principal official accountability system by former chief executive Tung Chee-hwa, the role of the Financial Secretary has transformed to become the government’s “cashier.” The scope of autonomous power has become quite limited. The consultation exercises for the Policy Address and the Budget had been held separately before. Since Leung took power, they have been combined into one, giving a further sign of the “coordinating” role of the Financial Secretary. In view of the change of role, some commentators said Tsang has merely handed out candies and coordinated allocation of resources among department as if it is a routine, without a touch of personal style. This is true. Government policy ideas and development strategies are set by the Chief Executive. Financial Secretary took orders and executed them. Take the just-announced Budget as an example. There are a list of tasks related to innovation and technology. They include a government injection of HK$2 billion for a midstream research programme for universities; an allocation of HK$8.2 billion for the Science Park to promote smart production and research, promotion of Fintech and the setting up of a HK$2 billion Innovation and Technology Venture Fund. They are tasks set out in the Chief Executive’s Policy Address. Expenditure items in areas related to “Belt and Road” and land resources are work set out in the policy blueprint. Confronted with limitation in “room” for manoeuvre, Tsang has set aside a HK$20 million fund for the distribution and promotion of local movies, which sends a clear message of his support for local movies. Taking together with his tolerant attitude towards localist thinking, his initiative on local movies has put a personal touch in his otherwise lacklustre Budget and, in a little surprise, helped him win some applauses. Be the first to comment on "Tsang puts a ‘localist’ touch in 2016/17 budget"